Earmold Australia®™ using our custom made earplugs can produce ready to go, on the spot stereo headsets which can be used for a multitude of uses. In 1999 were asked if we could make a way of having speakers sit comfortable in your ears that didn't fall out or be painful to wear, so we developed what is now the largest range of custom made in ear music systems available in the one location. We had a lot of complaints from people that their off the shelf ear buds were uncomfortable, couldn't be heard in loud environments or kept breaking. So using our custom made hearing protection we made a flat fitting earplug and then developed small electronic speakers fitted into the earplug putting the sound directly into your ears. The outcome is fantastic sound, superior comfort and a product that last for years. Available as a listen only or phone connection including bluetooth I'm sure you'll find something to suit your needs and budget. Available with or without an in line volume control, micro phone and also stereo or mono, we also make components to suit two-way radio units as well. These units are great for Motorcyclist, people who like to exercise with music, in the plane, on a bus or if you just want to sit back and read a good book and shut the world away. No need for the extra cost of impressions, no waiting weeks to get your custom head set, made on the spot and most times ready to use within the hour. Please note our range of custom electronic in ear music monitors are all made by Earmold Australia and its acredited agents, we do not send your Earmolds away for someone else to make them, we do it all in house saving you time and money. 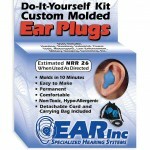 A fitting for the custom made ear plugs is required and can only be done by one of our accredited agents. Note: This product is produced for the enjoyment of listening to audio/communication devices. But please remain aware of the dangers of listening to these devices at a loud volume level (85dB ). OSHA regulations state a volume of 80-85dB is safe for an eight hour period of time. If you are concerned about your hearing, please consult a hearing specialist who can advise you about your safety levels with your audio device. Volume control cable 50cm in length.